Fred grew up in Miami, Florida and started playing golf at the young age of 11. He always had a constant desire to be around the game of golf. Fred is a PGA Class A Member and a Graduate of the PGA of America Professional Golf Management Program. The PGA-PGM is a 4 year/600-hour comprehensive course preparing USPGA Professionals for all aspects of the Golf industry. Fred's major in the program was the Analysis of the Golf Swing and Junior Golfer Development. He also attended Florida International University and has an Engineering Degree. He turned pro in 1989 and to date has logged more 14,000 hours of teaching golfers of all levels from as young as 2 years old to as senior as 82. From total Beginners to scratch Players and not to mention the Physically Challenged. However, his favorite students are the kids. 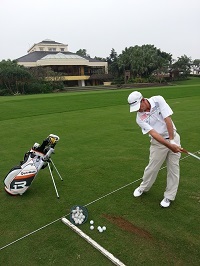 Fred is currently playing on the Asia Pacific Champions tour and plays in numerous tournamnets worldwide.